Submitted by Laura Bang, Falvey’s Digital and Special Collections Curatorial Assistant, and she found this wonderful historical poem to share. This poem comes from page 2 of the first issue of The Villanova Monthly, from January 1893. The Villanova Monthly was the first student newspaper, published from 1893-1897. Returning after a hiatus in 1916, the paper was renamed The Villanovan. 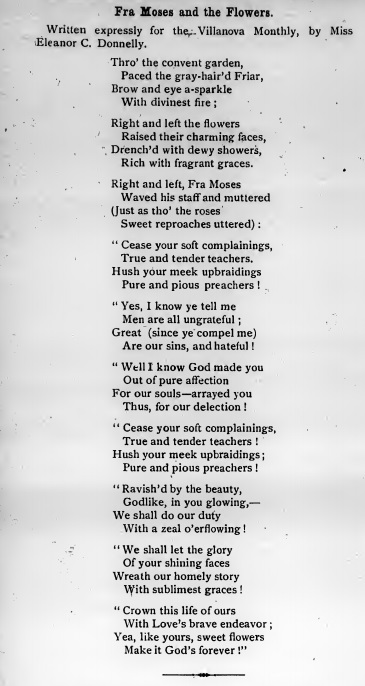 The poem itself is by Eleanor C. Donnelly (1838-1917), a local Philadelphia Catholic poet. Falvey has digitized the Eleanor C. Donnelly Papers from the American Catholic Historical Society, which can be viewed in our Digital Library.